FCJ Marine is a Honda Marine authorized dealer, servicing new and used engines and motors. certified technicians make sure we focus on quality and customer service. We proudly offer you the Full Line of HONDA 4-Stroke Outboard Motors, which includes the Portable, Mid-Range and Large Motor categories. From the dependable 2HP all the way to the most recently released and powerful 250HP models, all HONDA Outboard Motors comprise top-notch combined technologies and unique features which ensure you an optimum performance with the market's lowest and leanest fuel consumption rates, incredibly quiet operation, precise but friendly drivability and unmatched reliability. Call us today for a new Honda Outboard free estimate and get ready to enhance your boat's performance as you've never experienced before. The best warranty in the industry, on the best products in the industry. No strings. No catches. And only from Honda. Ready to get out on the water? Honda's low rates can help you get there. 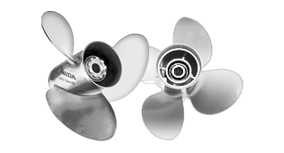 Honda's prop selector tool can help you find the right prop for your outboard, in just 4 easy steps.